With just a bottle of brandy to help them through a terrible storm, 10 men huddled for warmth as they drifted at sea for 22 hours. But these were the lucky ones. Their crewmates had already been lost in the rough, icy waters after the lifeboat had capsized twice in atrocious conditions. This was the tragedy that happened 100 years ago following an aborted rescue mission and left an everlasting mark on a small Gower community. A church service and memorial walk took place on New Year's Day while an exhibition at Port Eynon Village Hall remembers the volunteers that lost their lives. It was on 1 January 1916 that the 13 crew members of the Royal National Lifeboat Institution's (RNLI's) boat Janet were at work in the area. At about 11:45 GMT, a rocket was launched from the station to tell them they were needed. Soon after this, the volunteers took to the water in the Horton and Port Eynon lifeboat to go to the aid of a cargo ship. The SS Dunvegan had got into trouble in Oxwich Bay, just off Pennard, after its engine had failed. While it dropped its anchor, the storm was so strong, it was being pulled out to sea. The Mumbles station was closer, but it was decided to send a boat from Port Eynon as the direction of the wind meant the men would not be fighting against it. But after finding the Dunvegan, all crew members decided to stay on board and were eventually pulled to land by rope from a nearby cliff. Not needed, the Janet - a sailing boat with oars but no engine - decided to make its way back to Port Eynon. But now it was sailing against the wind and the RNLI's Brin Hurford said: "It capsized after the mast broke, with everyone going in the water. "When it self-righted, they found that Billy Gibbs, William Eynon and George Harry were missing. "While they found Gibbs and he was able to get back on board, it capsized a second time, which was when he was lost." The 10 survivors now had no mast or oars, so drifted towards Mumbles overnight, arriving at daybreak. "It wasn't like now, with the volunteers wearing proper thermals. They wore dry suits, with wellies and oil skins and once they were wet, that was it," said Mr Hurford. "There was no hot food or drink and all they had between them was a bottle of brandy." While Eynon and Harry's bodies were recovered, that of Billy Gibbs was never found- although an unidentified body was spotted off the coast of Porthcawl. There have been no local men lost at sea since and Mr Hurford said the 1916 incident left a lasting impression on the community of about 500 people. As villagers marked the centenary on New Year's Day, he said there were strange parallels to the conditions a century ago. "It's quite bizarre in a way. In the lead up to it in late 1915, the weather was quite warm for December, with a lot of storms then following," he said. "It is similar to what we have had over the past few months. When we did the [memorial] walk, it was blowing a gale, with the only difference that the wind was south-westerly not south-easterly." At the time, the RNLI was going through a process of replacing their lifeboats with newer, motorised vessels and after the incident, stations at Tenby and Mumbles covered Port Eynon's area. It was not until 1968 that a lifeboat returned to Horton and Port Eynon, with Walter Grove, the son of the tragedy's survivor William Grove Junior, instrumental in this. His children Lawrie (operations manager) and Courtney have also served on the lifeboat as well as grandson Tom, showing just how strongly it is tied to the community. 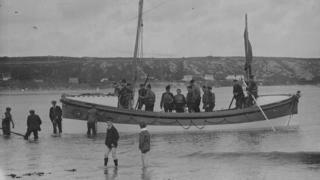 Another indication of this was the large number of descendents of the crew who came forward to help mark the centenary. The RNLI exhibition, which runs until 16 January, is called Hope in the Great War and honours volunteers who risk their lives. It is touring the UK and tells, as well as the Horton and Port Eynon crew, the stories of other brave men. A play based on the events is also being performed daily at St Cattwg's in Port Eynon. At the gates of the church stands an everlasting tribute to the three men who lost their lives on that fateful day - a memorial statue of a lifeboatman, with his gaze forever searching seaward.